Preheat oven to 375 degrees. In a bowl, mix together the berries, coconut palm sugar, flour and lemon juice. Stir to combine and pour into a 9 inch pie plate. In another bowl, combine all crumb ingredients except for butter and stir together. Add in your butter and pinch together with your finger tips until crumbs form. 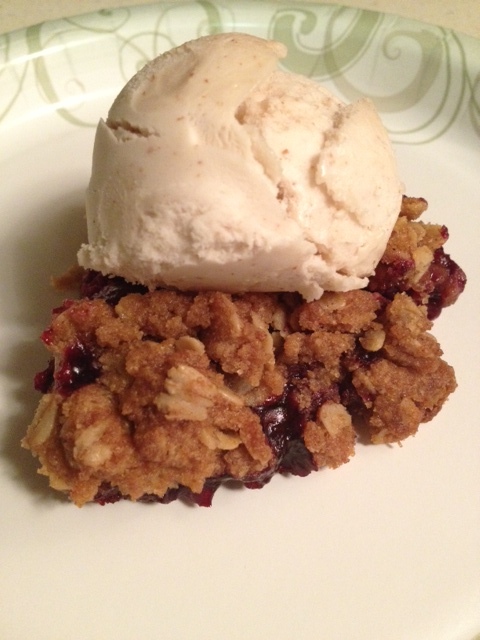 Sprinkle this mixture on top of the berries and place into preheated oven for 45 minutes. Berries should be bubbly and crumb should be lightly golden brown. tomatoes, black olives, cheese, and bottled dressing. I know, me using a bottled dressing is crazy! I've recreated this dish to be much more healthier and tossed the bottled dressing idea. 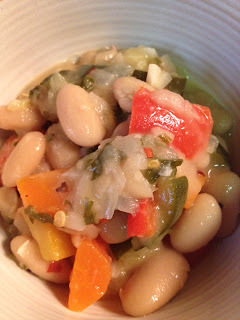 Here's a great dish to bring to any lunch, dinner or BBQ. Quinoa is a complete protein containing all nine essential amino acids. Quinoa contains almost twice as much fiber as most other grains. Even though it is called a grain, it is actually a seed. Quinoa contains Iron, lysine, magnesium, riboflavin (B2) and manganese. Put quinoa and water in a medium saucepan and bring to a boil. Reduce heat and simmer covered for 10 minutes. Remove from the pot and let cool completely. (you can refrigerate it to speed up the process). In a mixing bowl, mix together the tomatoes, olives, cheddar, parsley, lemon juice and olive oil. 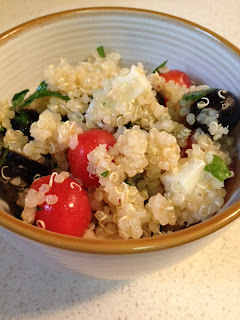 When quinoa is cooled, mix together with the tomato mixture. Season to taste with sea salt and pepper. 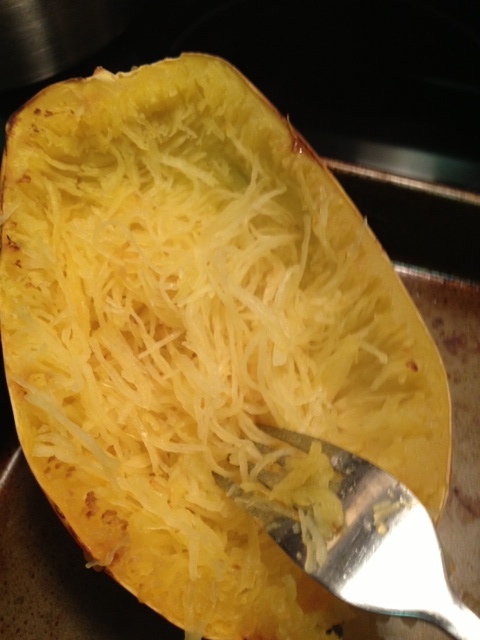 Spaghetti squash is a great alternative to pasta. It is great for anyone watching their carbs or on a grain free diet. This dish is so simple to make and very satisfying. My kids enjoyed this dish very much and asked for seconds. They were asking for more "spaghetti" so I knew they had no idea that they were eating squash. -It contains manganese, potassium, magnesium, calcium, copper, iron, phosphorus, sodium, zinc and selenium. Cut squash lengthwise. Be very careful, sometimes it is hard to get through the skin. Scoop out seeds and fibers and place cut side down on a baking sheet. Bake at 350 for about 25 minutes or longer depending on the size of your squash. Do not overcook, otherwise it won't come out like spaghetti, it will be more mushy. When done, let cool enough to handle. Hold each side and scrape with a fork until all the flesh has been removed. 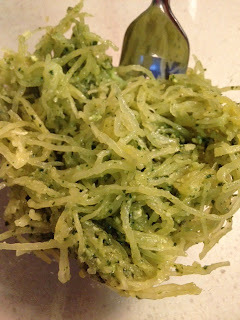 Transfer "spaghetti" to a bowl and top with pesto. Stir to combine and serve warm. Chocolate Soft Serve "Ice Cream"
This recipe is adapted from this recipe from Detoxinista. 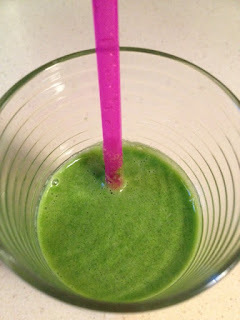 Blend all ingredients in a blender (I use a Vita-Mix). 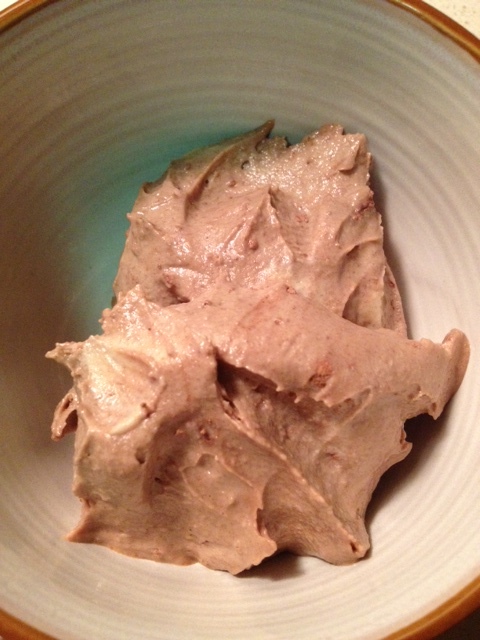 Serve immediately for a soft serve ice cream or freeze for a little to firm up a bit and then serve. I've never froze this overnight so i'm not sure how hard it will get for longer periods of time in the freezer. It usually doesn't last that long in our house and we never have leftovers! We love tacos around here, we usually make bean or chicken tacos. Tonight, I was originally making salmon but my son wasn't in the mood for it. To get him to eat the salmon I made it into these fish tacos which ended up to be so good that I had them too. Now I think we have a new favorite meal! This is a great way to get kids to eat salmon, which is so good for them. Preheat broiler and place salmon on a baking sheet skin side down. Brush with olive oil and sprinkle with salt and pepper. Broil salmon for about 8 minutes until cooked through and browned on top. Remove and let cool enough to handle. Place corn tortillas into the oven at 425 for 1-2 minutes to get crispy. 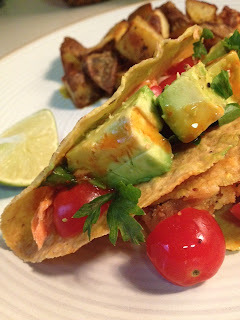 Layer salmon, avocado, tomato and cilantro into taco shell. Add hot sauce on top and a squeeze of lime. 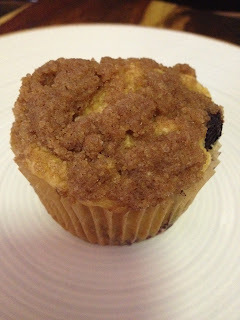 A special treat for my daughter is bringing her to the health food store and letting her pick out a gluten free muffin. There are only a few places that I can go where she can pick out something right from the counter and it is good for her to eat. This was becoming a weekly thing, so I knew I had to create these muffins myself. They make many flavors, but blueberry seems to be her favorite. I created these blueberry crumb muffins, that are not too sweet and are gluten, dairy, soy, corn, and nut free. Preheat oven to 350 degrees and line a muffin tin with paper liners. 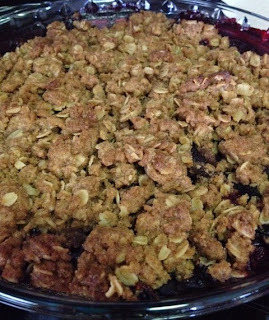 In a bowl combine all the crumb ingredients and mash with a fork until crumbs form. Set aside. In a large bowl combine the flours, starches, sugar, xanthan gum, salt, baking powder and baking soda and stir together. In another bowl whisk the eggs, oil, vanilla and milk until combined. Add the wet ingredients to the dry and stir together. Stir in the blueberries. Spoon into muffin tins. Spoon crumb topping on each muffin and press lightly into the top. Bake for 30 minutes. This is a great meal all by itself or as a side dish. It is packed with nutrition from all the veggies and beans. This is a great vegetarian dish. This dish can be spicy or mild depending on your preference. Enjoy! Heat the olive oil in a large pan. Add the zucchini, carrot, onion, garlic and bell peppers and cook until softened. Add the beans and cook until beans are heated through, about 20 minutes. The sauce will begin to thicken. Add the parsley, salt and red pepper flakes and stir to combine. This is one of my newest combinations and it is so good. My kids don't eat much lettuce, and this is a good way to get it to them! There are many benefits to eating Romaine Lettuce. Romaine lettuce is 17% protein, one head has about 200mg of calcium and 44% RDA of Omega-3 essential fats, 167% RDA of vitamin C, 6mg of iron, and is rich in B-vitamins: Thiamine (B1) – 38% RDA, Riboflavin (B2) – 32% RDA, Niacin (B3) – 12% RDA, Pantothenic Acid (B5) – 18%, Pyridoxine (B6) – 36 %, Folate (B9) – 213%, contains 20 ounces of water, 33% RDA of copper, 22% RDA of magnesium, 42% RDA of manganese, 27% RDA of phosphorus, 33% RDA of potassium, 5% RDA of selenium and 13% RDA of zinc! Put all ingredients through a juicer and enjoy!